I have a family member (brother in law) that had mentioned to his wife that he wanted to begin doing finer woodworking. He’s in general construction so he doesn’t get much chance to make smaller finer items. So what better way to hone your fine working skills than making things like spoons, spatulas and other small items? With that in mind, I endeavored to put together a little kit for him (you can see it in the video but it’s standard stuff). He has about a 10 square foot apartment so he needed something small he could keep around for when he wants to work. The box is my own little design, it’s simple. 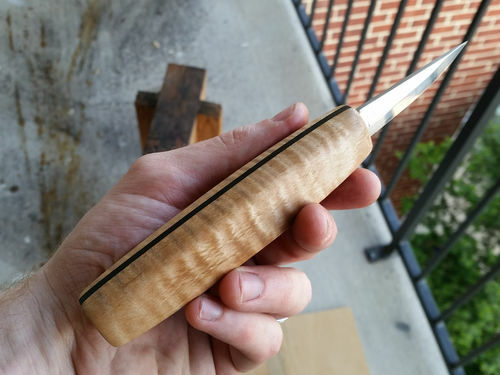 Fingerjoints on all corners and a simple lid design. Wood is maple and white oak. It’s small so he’ll have space for it in his small apartment. Plus I didn’t jam pack it full of stuff so he’s got some space to add some items as he learns and grows in his skills. The knife I made from some stock I had leftover from the side maple pieces, the middle piece is ebony for contrast. I used the same stain so it would match the box. The blade blank was a Mora 120. It’s the little things that we do for the people we love that make the difference in a craft. So I’ll just end with this thought. Make things that you love, but more importantly, make things for other people that will last for years. That’s a surefire way to ensure that you leave a lasting and loving legacy for your family and your friends. Just a simple project, thanks for reading/watching! Cool! I’m sure he’ll like it! Great way to spread the friendship of woodworking. I’m sure he will enjoy the tool chest and the knife. Elegant. Nice wood, clean and simple. Thanks for sharing. Picker, I like the design. The woods are beautiful. It would be a help to your readers if you showed a view of the box with the lid up or off. It is also helpful if you add dimensions to your post. Keep boxing and keep posting. Very nice. I really like the knife handle! It’s a nice box and knife. He’ll love both.